Few congress venues in the world can boast such an enviable location as that of the San Diego Convention Center in California: right in the heart of the Marina district in the downtown, affording splendid views over the harbour and the city’s waterfront. By staying in this area during their leisure or business trips, travellers get the chance to enjoy the proximity to the promenade just across the street and visit a variety of art displays, shops and restaurants, as well as to join the popular trolley tours and boat trips. Although this venue is widely known for hosting international conventions, business networking gatherings, trade shows and even private events, one of its most celebrated annual occasions is the San Diego Comic Con. This big event for comic lovers reunites fans, writers, videogame creators, film directors, actors, cosplay performers and anyone related to the fantasy universe for a series of presentations, press panels, signings, meet-ups and more in the San Diego Convention Center during three or four days in a row. This year, the Comic Con 2019 in San Diego will take place between July 18th and July 21st. As stated above, the host venue could not be better situated, standing less than four kilometres from San Diego International airport, about one kilometre from the nearest Amtrak railway station and with trolley stops on the other side of the road. If you arrive in the city by plane, the most advisable way to commute from the terminals is by shuttle or taxi, the quickest and most convenient options to cover such a short distance. 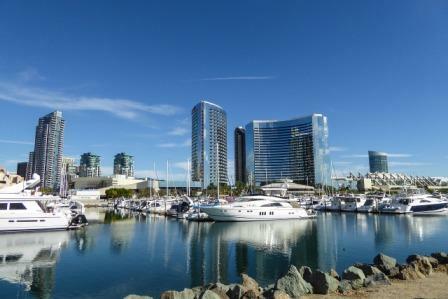 Most travellers who attend the San Diego Comic-Con and other events organised at the San Diego Convention Center by the marina choose to find accommodation in the surroundings, as this ensures they can make the most of the comic convention, while also getting easy access to the main attractions in the city. In this post, we have gathered some recommended places to stay with budget travellers in mind, so that nightly rates are not a concern when planning their trip. Continue reading to find out more about hostels and affordable hotels near San Diego Convention Center. This 2-star accommodation near the San Diego Comic Con venue is only one kilometre away from the facilities and offers comfortable individual and double rooms with shared bathroom. A thrifty alternative in the area, the Buckner hostel guarantees a nice stay where every basic need is met by providing free WiFi internet, in-room TV, a living area to meet up with other guests and a fully-equipped communal kitchen featuring microwave, oven and fridge. Furthermore, a varied continental breakfast is served on site every morning at this cheap accommodation ideal for San Diego Comic-Con attendees. Travellers who choose this accommodation near the Marina district of San Diego stay within a 10-minute stroll of the convention facilities and are provided with every amenity required to feel just like at home. Particularly indicated for business travellers, its more than one hundred deluxe and standard rooms are non-smoking and include large beds, TV, complimentary WiFi internet, mini fridge, microwave and private bathroom. You can book a room with two double beds or an accessible one if needed. Besides, there is a daily breakfast buffet available for guests, as well as a launderette and secured parking spaces in this hotel close to San Diego Convention Center. This affordable hotel in San Diego not only lies close to the venue but also provides easy access to several trolley stops. It offers fully-fitted spacious guest rooms with free WiFi, cable TV, extra large beds, microwave, mini fridge, work desk, bathroom and living area. Aside from that, extras like safety deposit boxes, secured parking, laundry service, varied breakfast on site and business centre are some of the reasons why many travellers decide to stay in this hotel near the San Diego Convention Center in California. Some visitors take advantage of this location in order to visit Sea World and other attractions and landmarks in the city before their stay comes to an end.